What did our Blessed Mother think as she heard Pilate pronounce the sentence of death upon her Son? What did she think when the religious leaders and agitators within the crowds gave their strong vocal consent? Perhaps, as she continued to ponder these words, “His blood be upon us and upon our children,” she would have transformed that statement into her deepest prayer. As she stood before her Son on the Cross and contemplated these words spoken just hours before, our Blessed Mother would have realized they expressed Jesus’ deepest desire. He desired that His Precious Blood would indeed be poured out upon all people, including those responsible for His death. He would have desired that His Precious Blood would cover them all, washing away their sins and sanctifying them so that they could enter His eternal Kingdom. Mother Mary would have shared this same desire of our Lord. 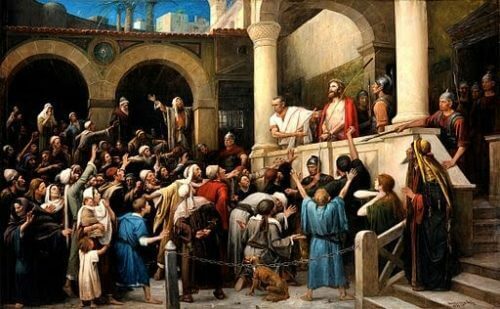 She would have forgiven the cowardice of Pilate and the harshness of the crowds. We are all called to shed our blood for the sanctification of others. Though Jesus is the one and only Savior of the World, we are called to participate in His offering. We are called to unite our own daily sacrifices with His one eternal sacrifice. To do this, we must let go of every bit of our wounded pride, anger, hurt and vengeance. We must desire that our own daily sacrifice be offered for the good of all, including those who have sinned against us. We must turn away from a desire for earthly justice and realize that mercy and forgiveness bring forth the perfection of God’s justice. Reflect, today, upon our Blessed Mother as she contemplated these words of the people, “His blood be upon us and upon our children.” Know that this became her deepest prayer during Jesus’ three hours on the Cross. As you contemplate Mother Mary praying these words, try to unite your own mistreatment, suffering and hurt to the Cross of Christ. Know that the free embrace of your own sacrifice can be turned into a blanket of grace and mercy for those who need it the most. My dear Mother, through the ponderings of your Immaculate Heart you were able to transform the harsh words of your Son’s persecutors into your own beautiful prayer. You were able to see that the blood shed by your Son was the source of grace and mercy needed, if not sought, by all. My loving Mother, pray for me that I may imitate your merciful heart and pray that your Son’s blood be poured out in abundance upon all those in need. My suffering Lord, give me the grace to unite my own sufferings with Yours and to unite the injustices I endure with the injustice of the shedding of Your Precious Blood. Help me to see all things through Your eyes and to love all people with Your Sacred Heart.